A commercial kitchen exhaust system is a MUST purchase for any commercial foodservice establishment. 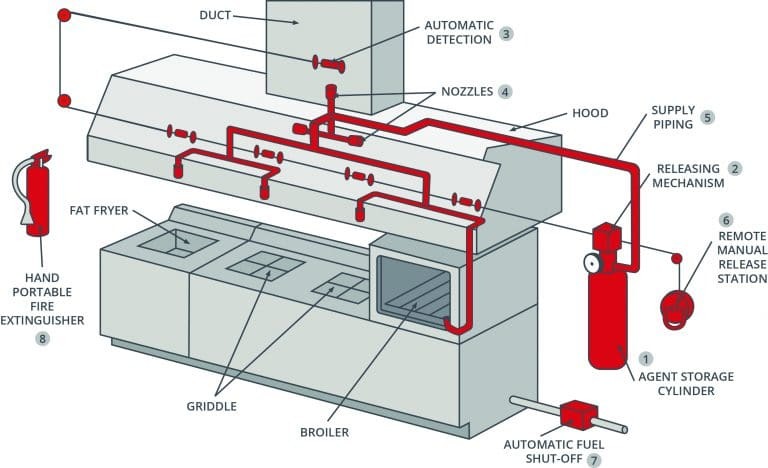 Not having the proper restaurant hood system and fire suppression system can not only cost your business expensive fines by the fire marshal, and sometimes even the closure of your business, but also create an unsafe environment for you, your employees and your customers. Since fires are caused by grease, every commercial kitchen needs a suppression system if you have gas OR electric equipment. Our trained hood system specialists will assist you in designing the best system to fit your needs. Direct Kitchen Equipment offers 100% stainless steel grease hood and heat hood systems for your restaurant or commercial kitchen. We will work with you to help determine which exhaust hood option is right for your business. We have every type of Exhaust Hood Solution for your needs. If you are looking to install a new restaurant exhaust hood or are simply replacing existing restaurant hoods, Direct Kitchen Equipment wants to be your partner in the decision making process. Contact us today to request a FREE commercial vent hood quote from our line of commercial hoods now. Call us at (347) 587-7488. and let us know what you need in your kitchen or, if you don’t know, we’ll inspect your area and make the necessary recommendations. Having clean and properly working kitchen hoods and grease containment systems will help lower your cleaning costs and prevent violations. You don’t want a minor kitchen flare up turning into an uncontrollable kitchen fire. To give your commercial kitchen maximum protection we can customize a new hood system package with a make-up air fan, upblast exhaust fan, and a built-in fire suppression system. If you have any questions please feel free to contact us at Support@directkitchenequip.com or call us at (347) 587-7488.